Why Will Poverty Decline for Beneficiaries? This article examines the origins and legislative development of the U.S. Social Security program over its 75-year history. 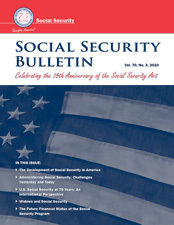 It traces the major amendments adopted over the decades and provides a summary assessment of the impact and importance of Social Security as a central pillar of the U.S. social welfare system. During its 75-year history, the Social Security Administration (SSA) has faced many administrative challenges. This article depicts some of those challenges—involving legislative demands, staffing and workloads, infrastructure and technology, logistics and procedures, emergency response operations, and other matters—and the steps that SSA has taken to deal with them. Among the social security systems of industrialized countries, has the U.S. Old-Age, Survivors, and Disability Insurance program followed a unique historical path? This article finds that the historical development of the U.S. Social Security system follows closely in many respects the model provided by older social insurance systems, particularly that of Germany. However, certain aspects of the U.S. Social Security experience stand out as exceptional from an international perspective, including the persistent rejection of general revenue financing, the significance attributed to long-range (75-year) projections, and the relative generosity of dependents' benefits. This article provides policymakers with context for understanding past and future policy discussions regarding Social Security widow benefits. Using data from household surveys, projections from a microsimulation model, and recent research, it examines three types of benefits—those for aged widows, widows caring for children, and disabled widows. This article describes four concepts—solvency, sustainability, shortfalls, and solutions—as they apply to the financial status of the Social Security program as well as how Social Security financing fits in the general federal budget. The little-understood basis for future projected shortfalls is explained and detailed in relation to the possible solutions.